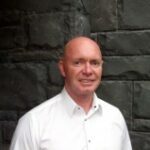 At the 2015 TOC Bulk Ports & Technology Seminar, Ray Lee, MD of Portside Solutions, explained the new system of Containerized Bulk Handling (CBH) and how the use of containers and rotating spreaders is proving very effective in some bulk operations, particularly in pit-to-port operations in Australia and Africa. The way bulk is exported has seen recent developments emerge. In the current financial climate and high demands, bulk exporters and ports are striving to be ever more cost effective and competitive whilst tackling environmental issues implemented by local governments. The Australian-based company, which provides operational and management support, has been helping ports and terminals reduce dust emissions from bulk handling for around six years in co-operation with equipment suppliers, which RAM Spreaders provides the rotating spreader called ‘RAM Revolver’ which plays an important part in the CBH system. The environmental benefit of using the CBH system is the elimination of dust emissions. The bulk commodity is sealed into special high cube 20ft containers and is only removed by the lid lifter on a revolving spreader prior to rotation at the bottom of the ships hatch. This sealed container system also eliminates commodity loss as well as avoiding contamination of the commodity during the transportation, storage and loading process. An additional level of dust suppression is achieved during the rotation process by fitting a water spray system around the top of the ships hatch. 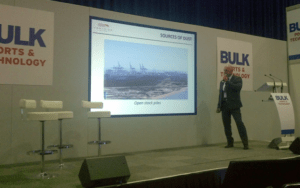 Developments in the bulk industry could be seen at the recent TOC (Terminal Operators Conference) Europe 2015, which was held in the city of Rotterdam. A few years ago, TOC introduced the Bulk Ports & Technology Seminar, providing the opportunity for companies and organisations to discuss developments and innovations in the bulk industry. 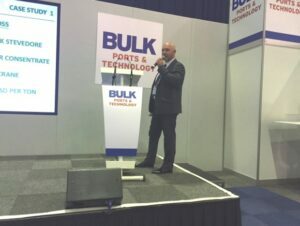 During the talk, Lee explained how DP World Australia has used the CBH system to temporarily turn a standard container terminal into a bulk handling terminal. He said that this system successfully prevented dust emissions, and the adjacent yacht terminal experienced no negative impacts. As this system is flexible, portable and a low cost solution, it can turn many standard container ports into bulk handling ports which would create new cargo traffic and revenues for the container ports boosting the economy and would reduce the environmental impact with the additional operations taking place. After delivering the talk, Lee was faced with a long queue of visitors eager to know a lot more about the CBH system and how it would benefit their operations. The high level of interest is testament to how the world of bulk handling is willing to adopt new innovations such as the proven CBH system. Since its establishment in 2007, Portside has also worked with Exxaro in the Democratic Republic of Congo, Puerto Angamos and TPR in Chile, Transnet, Ironclad and Maputo in Mozambique with introducing the CBH system.